If you’ve never had the pleasure of tasting a seared ahi steak, it’s high time you treat yourself to one of the leanest, most flavorful forms of protein on the planet. Ahi is the Hawaiian word for bigeye or yellowfin tuna, which are native to tropical and subtropical oceans. Given its steak-like texture (it’s not flaky like salmon or cod), ahi is often eaten raw or rare. It easily absorbs the flavors of any marinade and is best seasoned with simple ingredients so not to mask its flavor. Searing ahi tuna creates a slight crust that contrasts the meaty interior — this recipe uses Chinese five-spice seasoning to further enhance the flavor. When searing ahi, you’ll find that there’s generally no need for fancy oils or even aromatics like minced garlic. 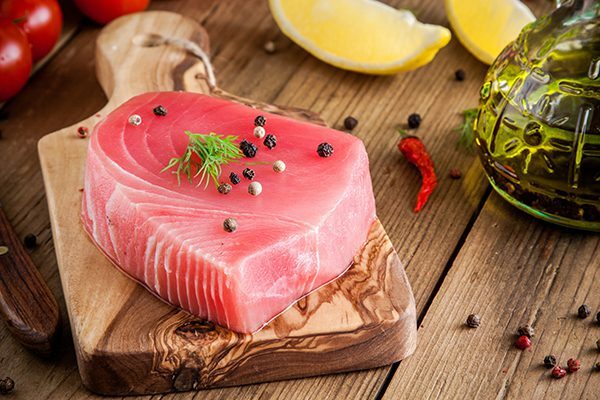 To sear ahi tuna, preheat your grill or broiler on high and after coating the protein with seasoning, coat the grill or broiler pan with a light spray of nonstick cooking spray. Gently place the protein on the pan (keep the heat on high) and let it sear for two minutes on each side. When a side is done, use tongs to rotate it to the next side. Make sure not to cook it through. I made that mistake once and ended up with a tough slab of fish. 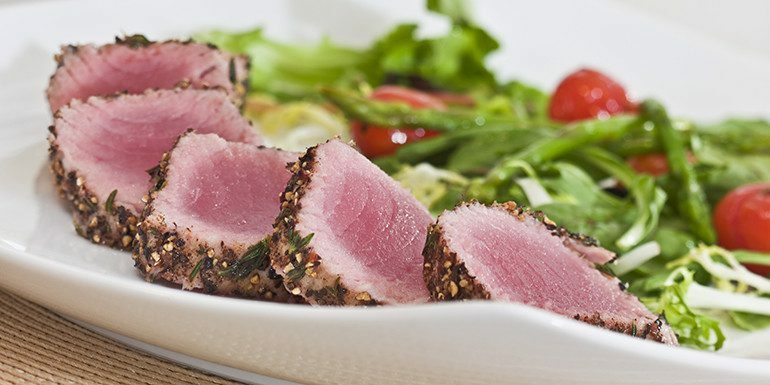 Once seared, slice the ahi tuna on a bias and place it on a bed of greens for a high-protein meal. 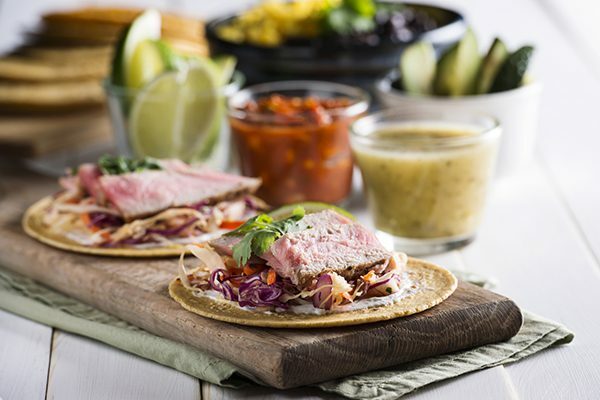 You can also fashion it into a sandwich by placing the slices on a rustic roll and top it with Bell Pepper and Cabbage Slaw, or wrap it in a corn tortilla along with some cabbage, avocado, and chopped mango for taco night. 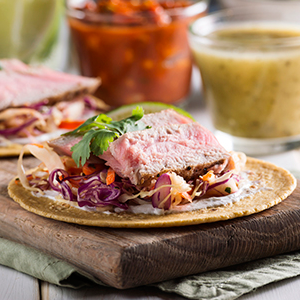 As if ahi weren’t already amazing enough, it’s also an impeccable weight-loss food. This recipe contains one gram of fat, two grams of carbs, and zero grams of sugar per serving — a dieter’s godsend. However, ahi can contain trace amounts of mercury, so it’s advised to eat it in moderation. Combine five-spice seasoning and salt in a small bowl; mix well. Coat all sides of ahi with seasoning. Lightly coat grill or broiler pan with spray. Sear ahi for 2 minutes on each side, or until desired doneness. Remove from heat. Slice tuna on an angle. Serve over mixed greens dressed with extra-virgin olive oil and lemon juice. 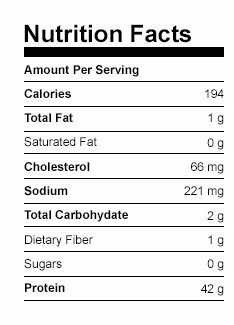 The nutritional information per serving does not include greens, olive oil, and lemon juice.